Pakistan has said 67 civilians died in US drones strikes in the country since 2008, a figure much lower than estimates by independent organisations. 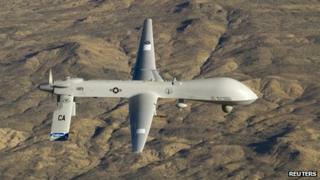 It said 317 US drone strikes killed 2,160 militants in Pakistan in the same period. The Pakistani Defence Ministry provided the figure on Wednesday in a written response to the Senate. It claimed no civilian had died in a drone strike since the beginning of last year. The US has defended its drone strikes by insisting that it takes "extraordinary care" to ensure they comply with international law. London's Bureau of Investigative Journalism, which researches Pakistan drone strikes, told the BBC it estimated based on reports that between 308 and 789 civilians had died since 1 January 2008 (of between 2,371 and 3,433 total deaths). A recent UN investigator said this month that Pakistan had told him that US drone strikes had killed at least 400 civilians in Pakistan since they began in 2004. "If the true figures for civilian deaths are significantly lower, then it is important that this should now be made clear, and the apparent discrepancy explained," UN special rapporteur Ben Emmerson said in an email sent to The Associated Press new agency. He has previously accused the US of challenging international legal norms by advocating the use of lethal force outside war zones. Pakistan's Prime Minister Nawaz Sharif on a recent visit to the US called for an end to drone attacks in his country, saying the attacks violated Pakistan's sovereignty. Drone warfare has become common in the US pursuit of al-Qaeda and the Taliban. Few details are known about these covert operations, which are directed remotely from control rooms often on other continents. A controversial aspect of the US policy is that drone attacks are carried out not by the military but by the Central Intelligence Agency. President Barack Obama has insisted the strategy was "kept on a very tight leash" and that without the drones, the US would have had to resort to "more intrusive military action".